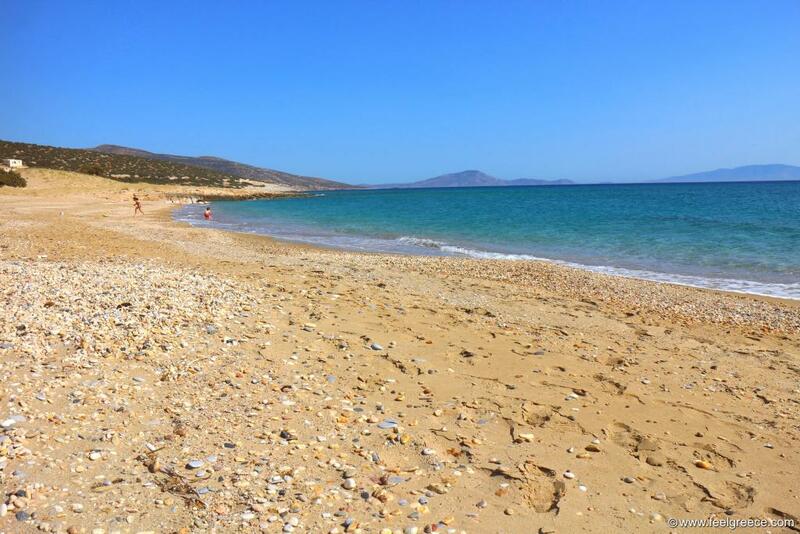 If you have ever heard the misleading statement that most beaches of the Greek islands are rocky shores with boulders and pebbles, here comes Naxos to disprove it. 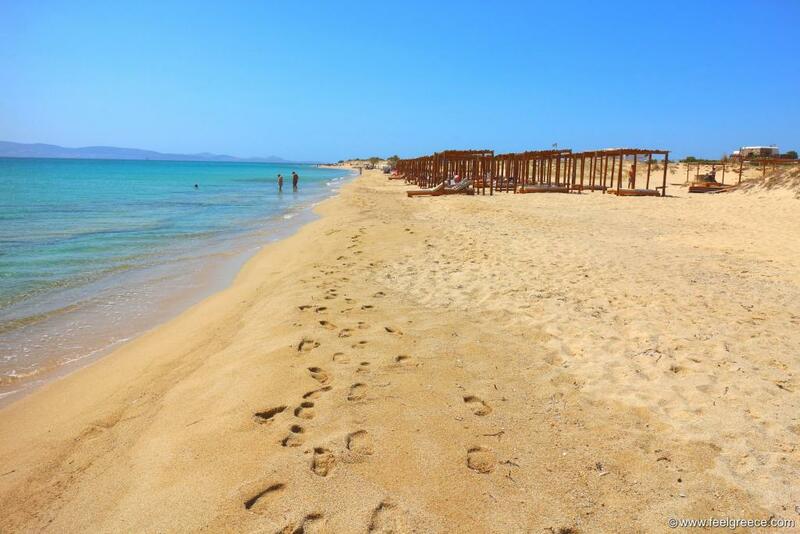 The largest of all islands of the Cyclades group is blessed with numerous beaches with golden sand and blue water. 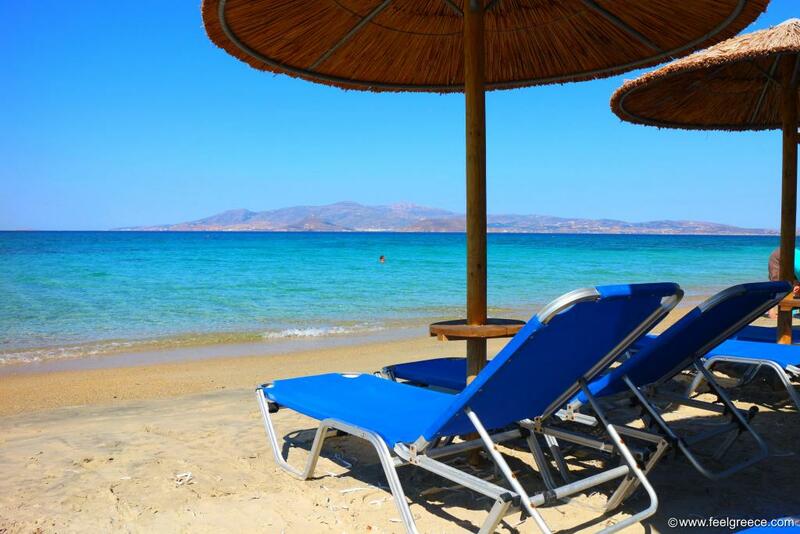 Practically, you will hardly see a rocky beach on Naxos, especially on the west coast where sand is in such quantities that even the most sand-demanding travelers cannot find a flaw. See which are the 10 best and most popular beaches of this island. This is the longest beach of the island - almost 4 km long uninterrupted strip, covered all over with sand. Part of Plaka offers beach bars, water sports and tavernas, and the hotels and villas are behind them. The farther south you go, the quieter the beach gets and there are huge empty sections where it can be only you, the sand and the sea. 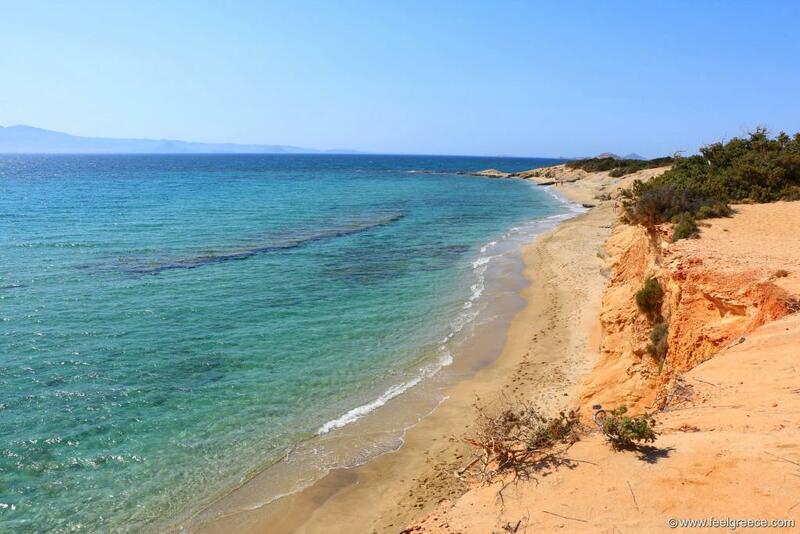 Though not very large, the beach of Agia Anna distinguishes with fine sand and extremely blue water. The sea is usually calm and wind-sheltered, and the only negative is that it may get crowded in high season because the beach strip is not that wide. 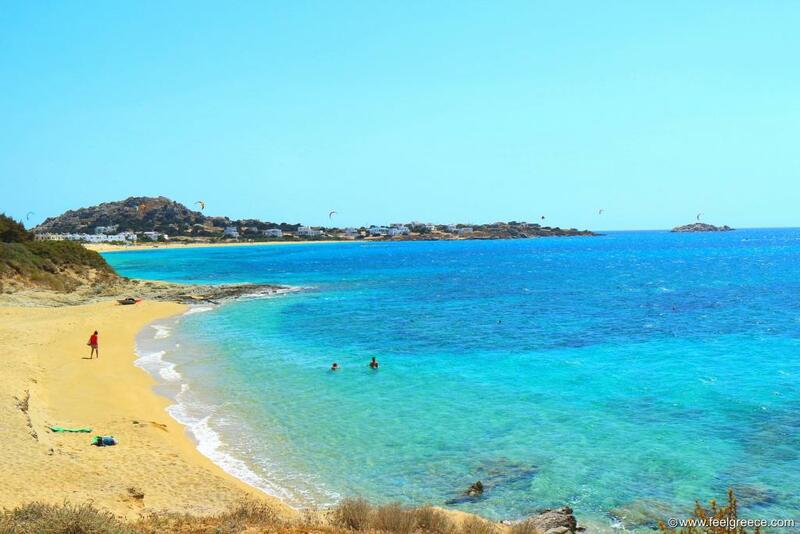 This beach is often ranked among the best beaches of Greece and more specifically, of the Cyclades islands. It is long, wide and organized with plenty of facilities, especially in the south part which is within the homonymous village limits. The north part borders the peninsula of Stelida and there you can find more privacy. Is it really No 1 on the island? Honestly, it has nothing more to offer than its neighbors Agia Anna and Plaka - the sea has the same vivid blue color and clean water, so it is just a matter of choice. The beach with exotic name is part of the nature reserve of Aliko - a small peninsula with cedar trees, sand dunes and a couple of beautiful coves. Hawaii impresses with the vertical reddish cliffs just behind the beach, creating a strong contrast with the yellow sand and the blue water. You may spot naturists, too, as the location and tranquility of the area seems to attract them. But don`t worry, the beach is long, the people are discreet, they do not intrude to anyone and usually they prefer the more isolated Kedros beach nearby. Orkos is the natural continuation of Plaka, which also includes a series of tiny coves on the way to windy Mikri Vigla. The lovely coves can be easily spotted from the road so they are not a secret to passers-by but yet they are usually empty and calm. 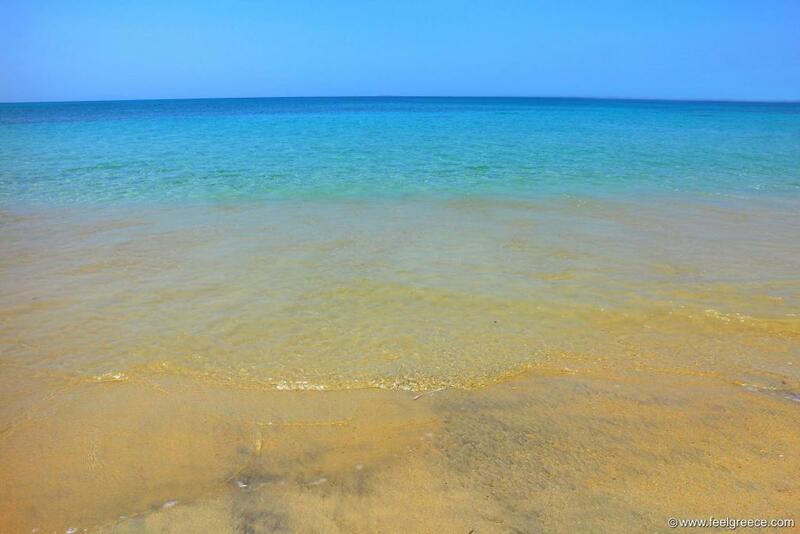 The blue color of the sea is in striking contrast with the golden sand. Kastraki is the prolongation of the south Mikri Vigla beach, slowly developing as a quiet holiday resort. And of course, it is as sandy as all beaches around. 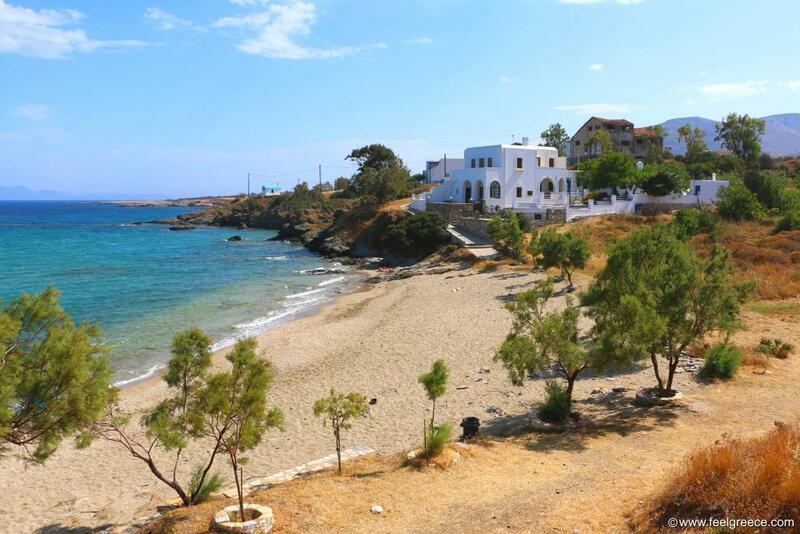 The lively beach of Naxos Town, Agios Georgios, is not only known as the closest beach to Chora. With its shallow waters and soft sand, it is the favorite of families with small kids. The sea is knee-deep meters away from the shore and even waves would not disturb you. Keep in mind however that the beach is densely built and densely populated, respectively. A bit weird location but with a couple of lovely sandy beaches. 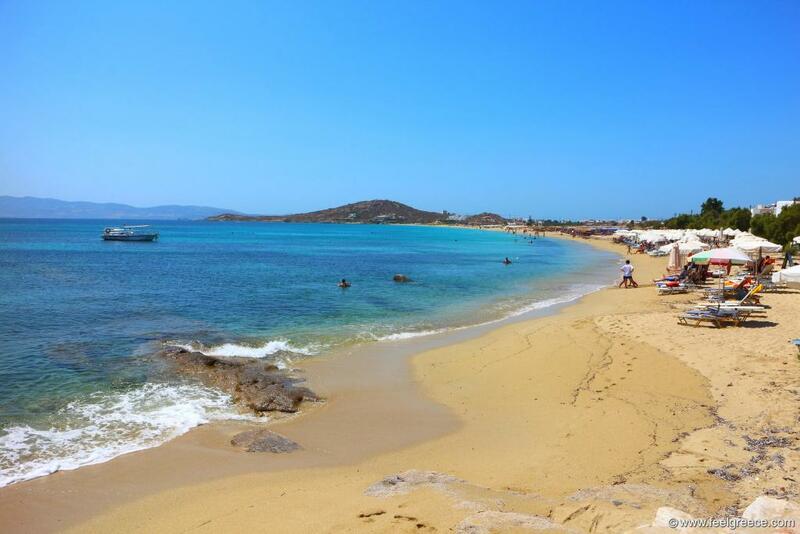 Moutsouna is one of the remotest villages of Naxos, with a handful of houses and a few fish tavernas. There are two small coves within the village and one just out of it - all with fine sand and shallow water. The unrestricted view to Donoussa island is a bonus. Another isolated beach but easier to get compared to Moutsouna. 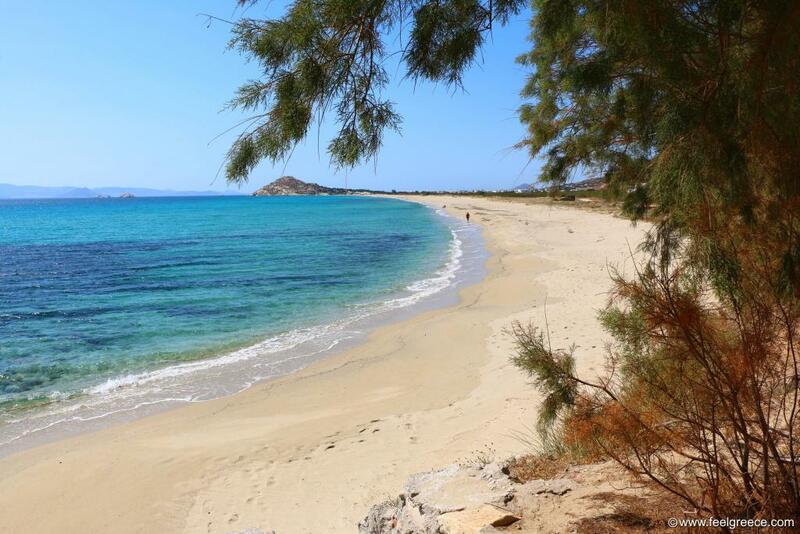 Agiassos is the southernmost beach on Naxos west coast where the asphalt road ends and makes a turn to the inner part of the island. Very long, very sandy and very shallow. If it wasn`t for the remote location, this would be the total favorite of families with small kids. The good thing about this beach is that it is very large and has both a beach bar and plenty of free space for those who prefer to be on their own, with their private parasols. The beach bar functions as a taverna as well and it is in the southernmost part of the beach, separated in a small cove with fine sand and shallow seafloor. In the rest part of Pyrgaki, the endless sands meet pebbles here and there.